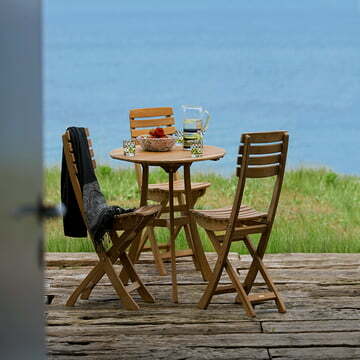 Secure the sturdy teak garden furniture as set price. The flowers are in bloom, the birds are singing and the wind warmly strokes your skin. Here it is, the warm season! How about having dinner in the garden? With the right accessories and outdoor furniture you can create the impression of being anywhere. Maritime Mediterranean feeling with warm teak wood or the allure of Paris with a bistro table. What are you waiting for? Get out in the fresh air and turn your garden into an oasis of well-being. You do not know how to start? How about the right dining table for the garden? Outdoor tables are not all the same! No, they exist in a thousand sizes, colors and variations: Tables made out of aluminum, wood, stainless steel, plastic, cement. The most important thing is that you buy a version which fulfills your needs. For a two person household or as a side table Skakerak's Vendia Table made of teak is exactly right. The manufacturer proves that lack of space is no reason to go without a properly designed outdoor table. Should your design table stand uncovered and be exposed to the elements the Bistro Folding Table by Fermob would be the ideal choice. It is weatherproof and can be put away in a space saving manner. You do not have a garden, only a balcony? That isn’t a problem either! The Balconcept by rephorm can be hooked over the handrail of your balcony. If you prefer a solid table, stick with the Lucca Cube by Jan Kurtz. Through the mixture of hot-dip galvanized iron and teak it is certainly an eye-catcher. You see there is the perfect outdoor table for every situation. So there is no excuse to not get out into the sun! You are contemplating getting a teak wood table or already have one? In the post "Teakwood - Maintenance Tips for Your Garden Furniture" on our home design blog there is all the information concerning teak. If you wish to redesign your garden or freshen up your oasis of well-being you might be interested in "Garden Decoration: The Most Beautiful Ideas for Your Garden". Just have a look! You want to buy a designer outdoor table online, but need support? Please feel free to contact our customer service. We help you if you have any problems with your purchase, give recommendations and we can quickly clarify questions. Let us send you your favorite product to your home, comfortably within a few working days!